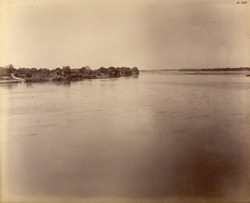 Photograph of the Ram Bagh at Agra in Uttar Pradesh, taken by Edmund William Smith in 1893-4, from the Archaeological Survey of India. The garden of Ram Bagh is believed to have been constructed by Mughal Emperor Babur (r.1526-30) and later the site of the resting place for his body before its burial.This is a general view of the ancient buildings lining the west bank of the Jumna looking up the river from the Ram Bagh. Smith wrote in Moghul Colour Decoration of Agra, 1901, "The Ram Bagh (garden of rest) is a large walled garden with a raised stone terrace on the riverside. There are octagonal towers or bastions surmounted by pillared cupolas at each corner of the river face; underneath, or in the body of the terrace, are a set of vaulted chambers, opening on to a lower terrace just on the water's edge; while above, or on the terrace, are two buildings, open baradaris, with chambers at each end and verandahs overlooking the river. By popular tradition the Ram Bagh was the resting place of Babar's body, from the time of death at Agra till it was conveyed to Kabul for burial; but it is generally believed that the garden was made by the Empress NurJahan, who frequently resorted here with her handmaids."